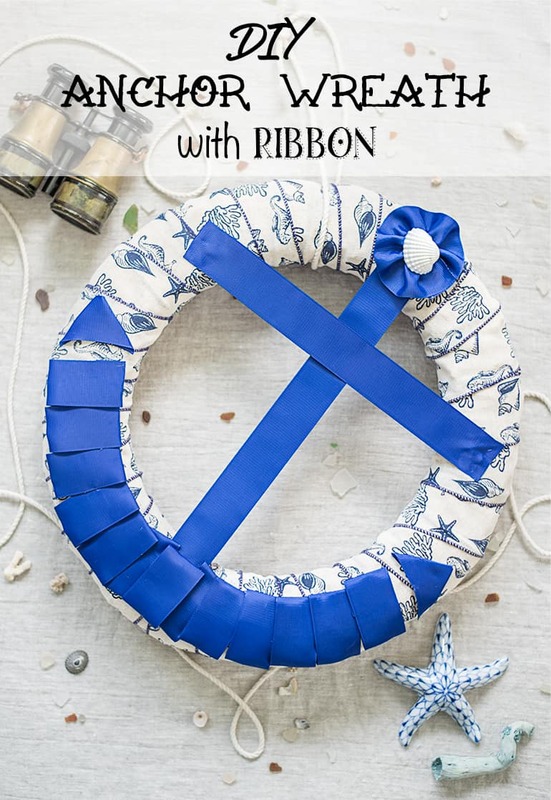 This DIY anchor wreath is cute and so easy to make with ribbon! 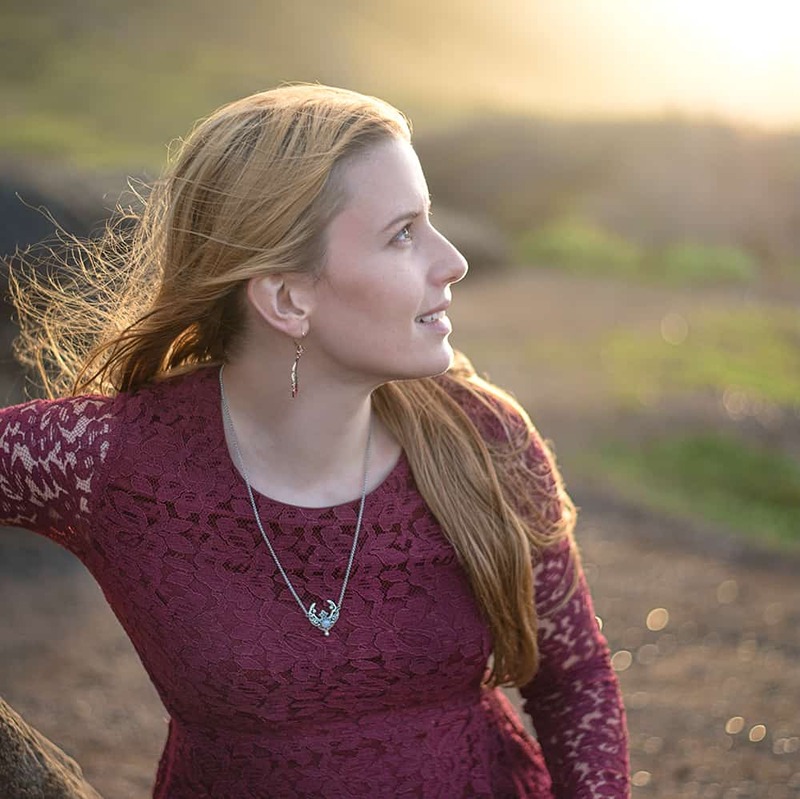 As regular readers know, I’m all about nautical style no matter the time of year! I realize that for most people nautical decorations are more associated with warmer weather, though. 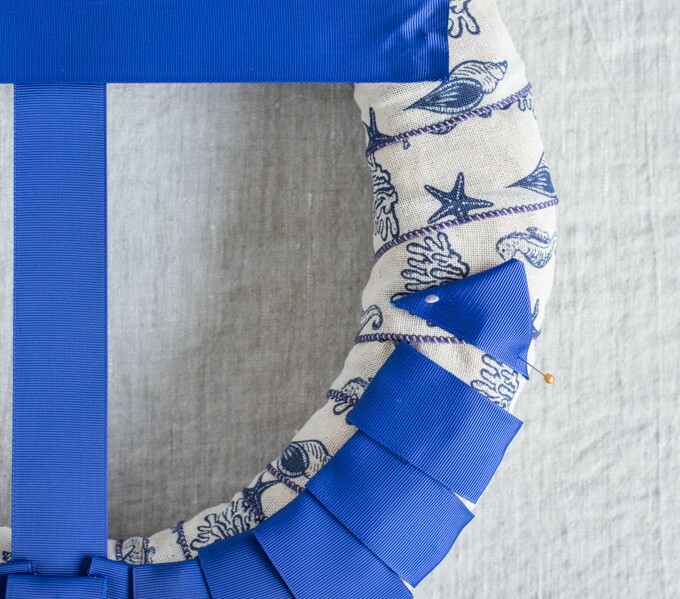 Since many people regard Memorial Day Weekend as the start of summer, I thought this week would be the perfect time to share this DIY anchor wreath! 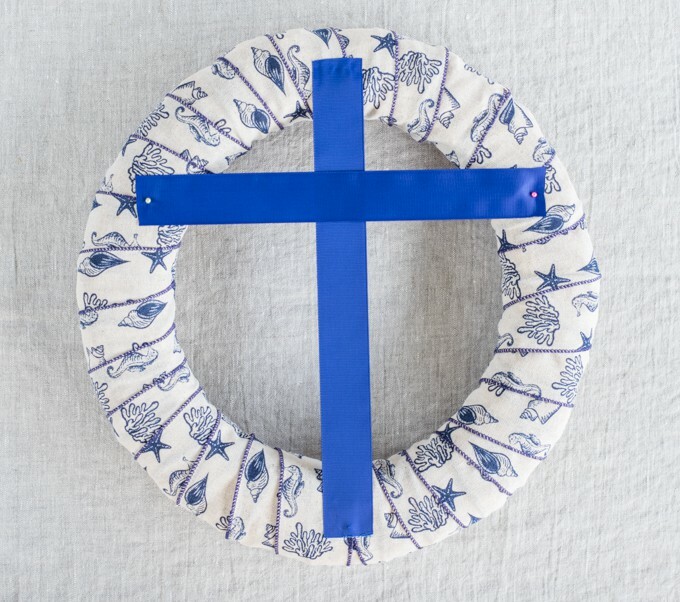 The anchor is made with ribbon, so you don’t need to worry about finding any wood cut outs or securing heavy objects to your wreath. It’s super easy to make and customize – I hope you enjoy! A wreath form! I recommend straw instead of foam for several reasons. They’re less expensive, biodegradable, and thicker! 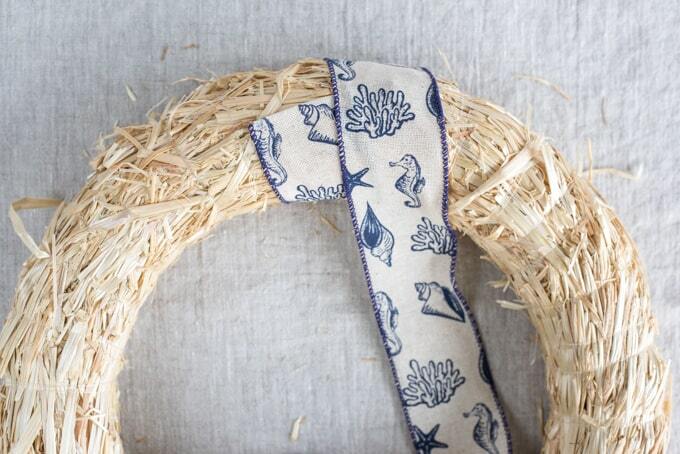 I used this 16″ straw wreath. 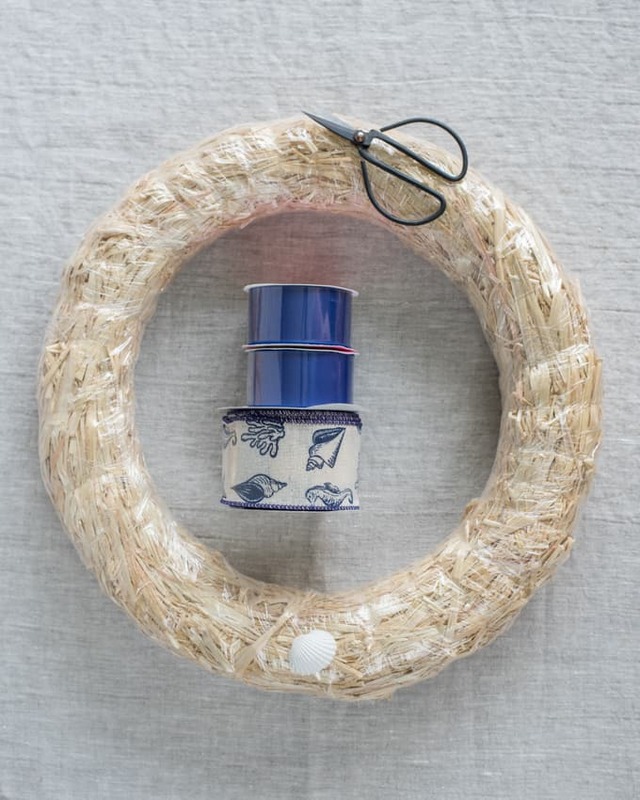 A solid or patterned ribbon to wrap the wreath. I used a 2.5″ cotton print with a wired edge and still have ribbon left over from my 10 yard spool. 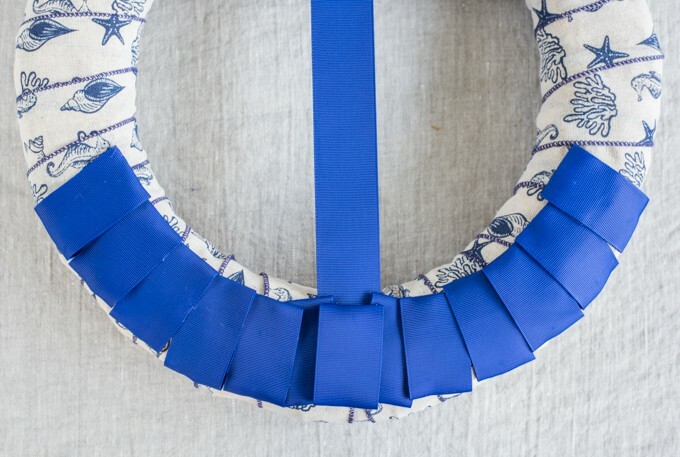 You can choose ribbon with or without a wired edge – it doesn’t really matter. Hot glue. I recommend using this post on hot glue tips and tricks! Seriously, you need silicone finger protectors yesterday if you use hot glue! First, remove the plastic wrap from your wreath. 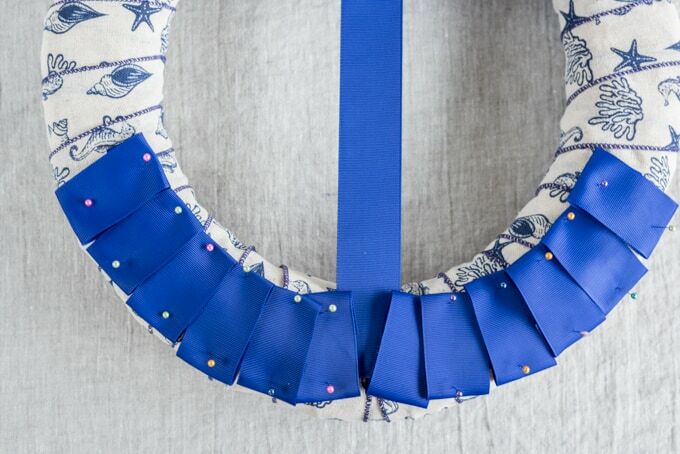 Before you start gluing, experiment with your ribbon a bit to find a nice angle for wrapping the wreath form. Using your background ribbon, play around with the angle of wrapping to find something that looks nice, doesn’t leave gaps exposed, but also isn’t so tightly wrapped you’ll use lots and lots of ribbon. I used less than one full spool for my wreath. Once you’re happy with the angle, start gluing your ribbon in place. You don’t need a solid line of glue along the whole ribbon – I used some on the “back” side of each wrap. This takes a lot less time and uses way less glue! Continue wrapping all the way around the wreath. When it is fully wrapped, cut the ribbon. Fold the raw edge under for a neat appearance (and less raveling!) and glue it in place. Flip the wreath so the folded under edge is now on the back. 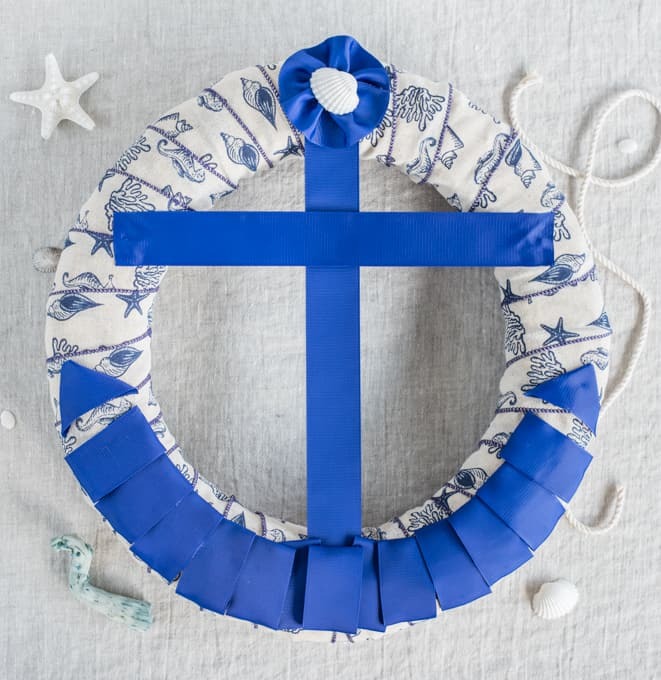 Cut a piece of your solid color ribbon so it can run straight across the wreath to form the central portion of the anchor. The exact length will depend on your wreath, but my piece was 14.5″. Carefully singe the ends with your lighter to prevent fraying. Glue this piece in place with hot glue, making sure it is as centered as possible. Pinning the ribbon before gluing can help you make sure the ribbon is centered. Cut a second piece of ribbon to form the anchor’s cross piece. Play around with the positioning to make the anchor look how you’d like it, but about 1/4 – 1/3 of the way from the top generally looks good. Again, singe the ribbon ends and glue in place. Once you’re satisfied with the placement, glue in place. And then, of course, glue in place! You’re almost finished with the anchor now! 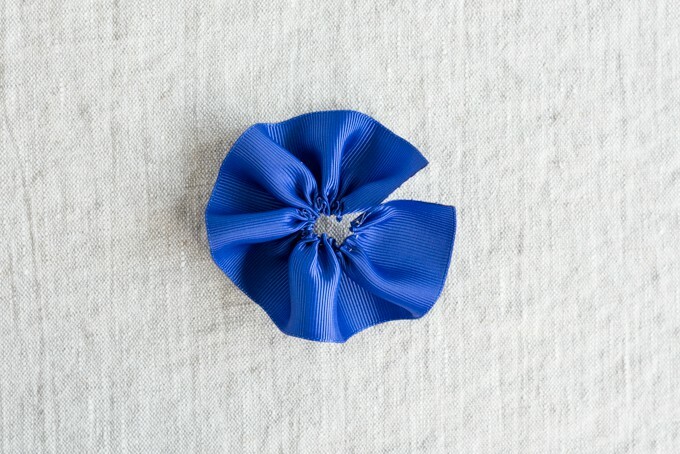 To make a rosette for the anchor’s top, cut about 12-14 inches of ribbon, singe it, and thread your needle with about two feet of thread. 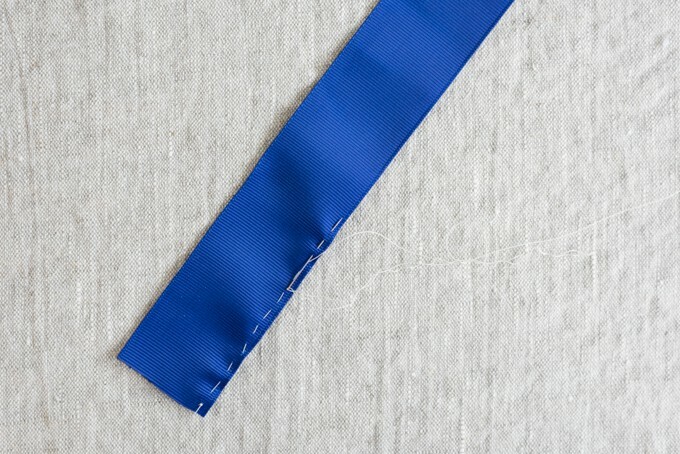 Tie a large knot in one end, them make a row of fairly large running stitches down one edge of the ribbon. Tie a piece of rope, cord, or twine around the wreath to act as a hanger, then enjoy your awesome new DIY anchor wreath! 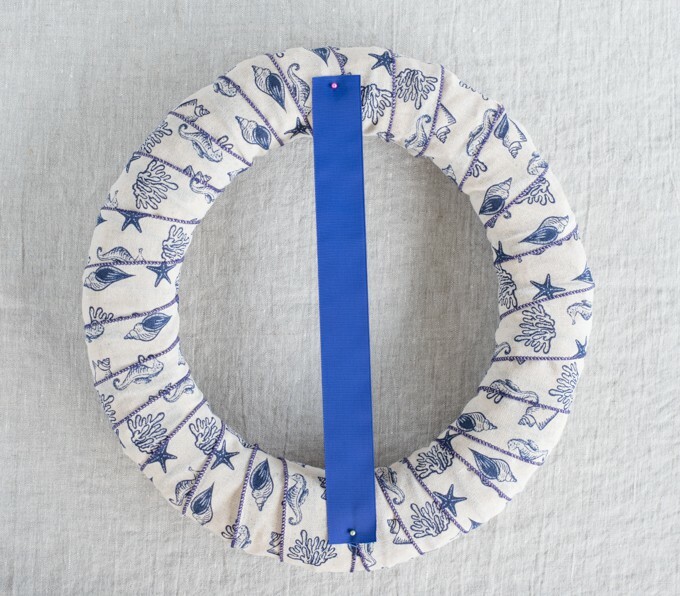 We can’t hang anything on our door, but our ribbon anchor wreath is looking cute inside! My driftwood and succulent wreath from this tutorial had been up since I made it 2+ years ago, so it’s nice to have something new on the wall! 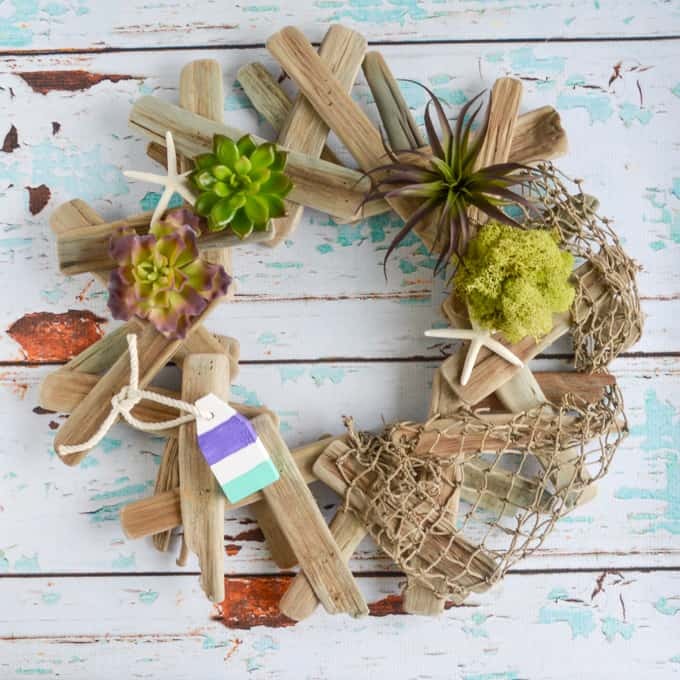 I really hope you enjoy making a DIY anchor wreath for summer! If you make one, I’d love to see it. 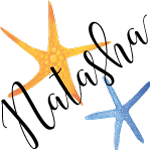 Please tag me @natashalhn on IG or @natasha5887 on Twitter so I can see your creation! 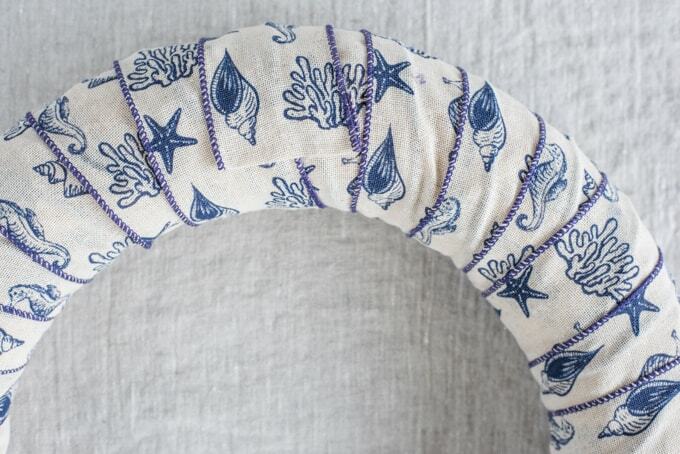 Are you decorating for summer yet? Hanging them inside certainly helps them last longer! 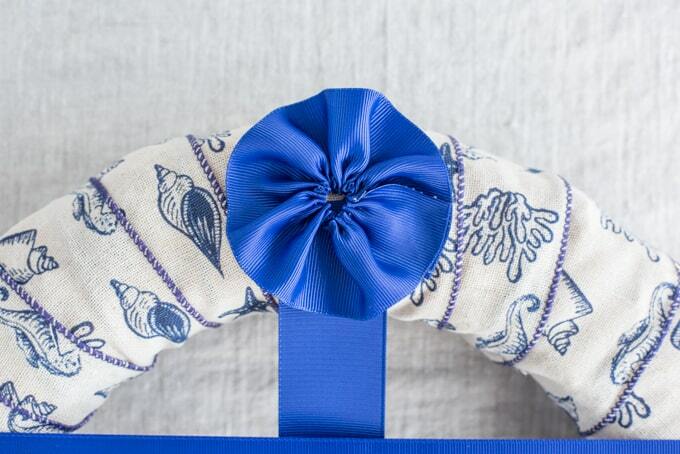 I am just about to order some lovely silk ribbons with a gift card I received and I can’t wait for them to arrive. Ribbons really are fun and versatile!